We’re on vacation this week, so I thought you might enjoy hearing from another chicken-related inventor. Jeremy Smith came up with a low-cost, dependable, premade automatic chicken coop door to protect his flock, then decided to share his invention with the world. I’ll let him tell you more in his own words. 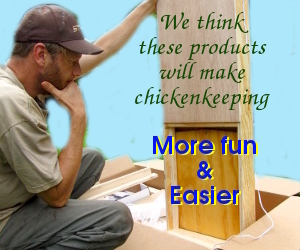 In our quest to find a door that was reliable and safe to use in our own chicken’s house, we came up very short. There is simply not much available out there. So, the master carpenter who works for me and I began designing our own coop door opener that would be trustworthy and that would cause our coop to be secure should we ever not be available to get the girls closed up at night. After designing and building our door for our own coop, we realized that we had something that other people like yourself might find useful in keeping your own flock. I know that our 28 Buff Orpingtons have been quite an investment in money, time and even care. It took 6 months of feeding, safeguarding and caring for before we ever saw our first egg, so you can imagine our concern when we found cats, raccoons, coyotes, you name it trying to enter our chicken’s coop. Who would have known that my family would have started keeping chickens much less be so concerned about their welfare? My wife who hated the idea of keeping chickens at first would now be heartbroken if something got a hold of one of our girls. If you have chickens, you know how much of a pet they can become. So we designed this Automatic Chicken Coop Door to help us protect our chickens but also give us our sanity back knowing that our chickens will be safe. Since we created our own door we wanted to share it with all the other chicken owners out there so they could enjoy chickenkeeping without the constant worry for their flock’s safety. To that end, we now offer a DIY version for $124.95 and a premade version for $184.99 to make predator prevention even easier for the busy homesteader. Because every chicken deserves a safe nighttime roost! This is the first draw bridge coop door opener I’ve seen. It has the added benefit of working as part of the entrance ramp. The motor is a common electric car window mechanism that can be found on Ebay and the Youtube video has a nice component animation that explains each piece and where it goes.